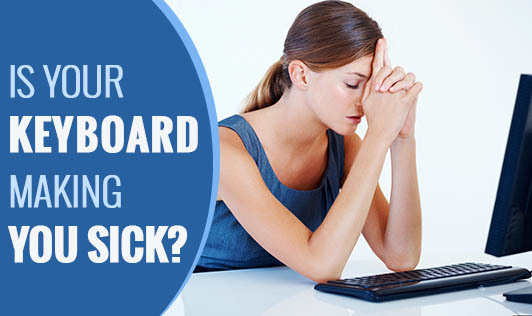 Is Your Keyboard Making you Sick? Did you know that your keyboard and mouse could be contaminated by several kinds of virus and bacteria that may infect you? Your colleague suffering from a severe cold may contaminate his keyboard or mouse. If somebody else comes in contact with it, they could get infected as well. A few studies done in some software companies around the world, found keyboards contaminated with coliform bacteria and staphylococci. While coliform bacteria cause food infections, staphylococci can lead to skin infections and food poisoning too. Though at most times the infection may not be very harmful, some infections could be dangerous too. What if you have kids at home? Many a times, kids use the computer and may eat with the same hands. This can cause a spread of infections to them. In hospitals, this kind of contamination could be dangerous to patients and health care providers. Many types of virus and bacteria can be transmitted from patient to patient and can create health problems. What is the best way to prevent them? Using a hand sanitizer to clean your hands before and after using your system can control the spread of infections a great deal. Also, using ethanol wipes to clean your keyboard and mouse can help check the spread of infections. Isn't it surprising how such commonly used equipment could lead to a spread of infections? Take some simple precautions to keep a check on the spread of infections.